Getting your business noticed at an exhibition can be difficult, and due to the wide range of elements needed, it can also be very expensive. From a business perspective it’s likely you are wanting to get a return on your investment, but it is also important to consider finding exhibition equipment that can be reused for different events. Even when your marketing message changes. Here at XL Displays, we thrive off being able to assist our customers in finding the most suitable exhibition stand systems for their money. We know that budgets are often tight and as a successful business you need to be able to stretch your money further and further. The good news is that no matter what your budget may be, we are more than happy to help you- without compromising on quality. When setting an overall budget for an event you need to consider all the costs included – not just your exhibition stand. Additional expenses you need to factor in are exhibiting fees, staff costs, advertising or promotion, marketing materials, equipment transportation and set up fees, including contractors, products, travel, accommodation and food. Even with a limited budget, you need an exhibition stand that will attract potential customers so it's important to consider graphic design to help promote this. With 20 years plus of experience in the exhibition industry, our team are experts in portable display equipment and bespoke exhibition stands. Therefore, they are able to provide you with exactly what you need at a price you can afford. Adding a branded presence to your exhibition stand doesn’t need to be expensive. 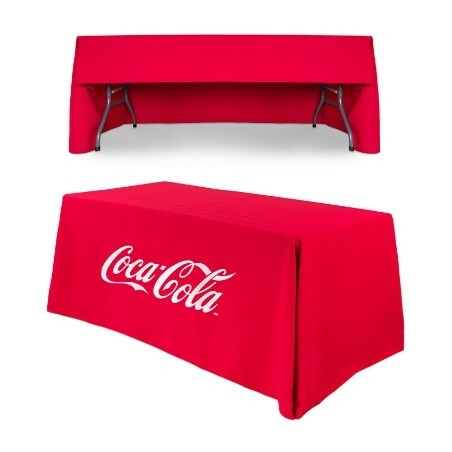 Take our custom printed tablecloths for example. At £52, these branded tablecloths are a great way to complete your stand to a professional standard, and with the option of 19 vibrant different colours, you are sure to find one to compliment your branding. The durability, feel and finish is of a premium standard. The linen fabric within the tablecloth has anti stain, anti crease and colour fast inhibitors infused within the weaves of the fabric to ensure it stays bold and looking like new even after repeated washes. They are also fully hemmed and overlocked to improve the drape and finish of the table cloth. 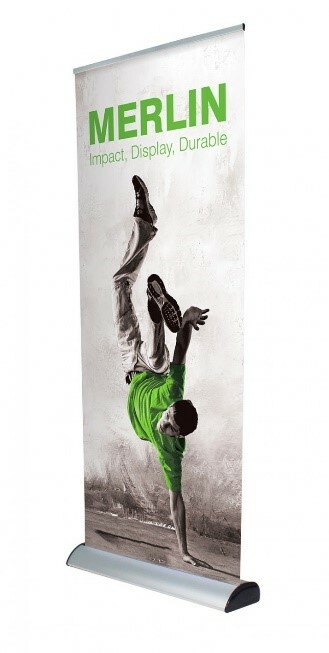 Another alternative for less than £60 is our best selling Grasshopper roller banner stand. At an amazing price of just £49.00, Grasshopper roller banners are the ideal budget choice as they are low on price but have a great marketing ability for a wide range of events. They even use the same high quality print and banner media as the more expensive stands in our range. Pull up banners- and especially the grasshopper banner-have long been core marketing tools for exhibitions due to their effortless assembly whilst providing exceptional brand enhancement. Regularly change your marketing message? No problem. Our Merlin Replaceable Cassette Banner Stand is the ideal, cost-effective solution at £124. The advantage of the Merlin banner stand is that the graphic cartridge is housed independently from the main base unit. This allows for easily disassembly and allows you to easily replace the existing graphics with new ones. This means you are able to replace the graphics yourself without the need to return the whole banner for new graphics or buy a new banner completely. The replacement graphics for the Merlin banner stand are less than our budget range roller banner, the Grasshopper. The replacement cassette is available at £44. 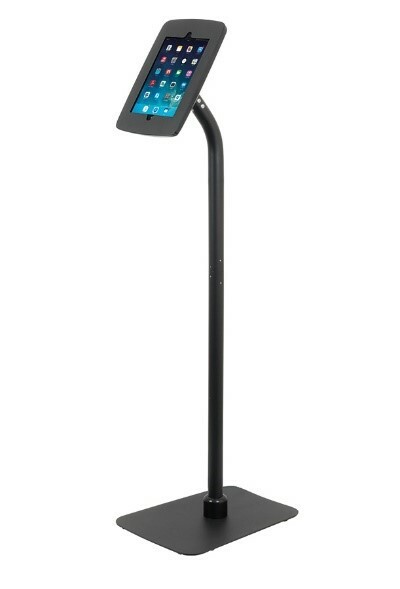 Our LaunchPad Tablet Floor Stand is ideal for adding an interactive experience to your exhibition display and provides a quick and easy access to photo and video media to show visitors on your stand. This tablet stand is a freestanding, tubular shape that is compatible with a range of Apple iPad or Samsung Galaxy models. The enclosure for the LaunchPad stand features a 40-75° adjustable viewing angle as well as 330° screen rotation, and at just £69, it is the perfect upgrade to an existing stand. A great way to gain maximum brand exposure is through our pop up display stands. Available in both a straight and curved configuration, there’s no better way to express your brand and marketing message than having a large format backdrop. 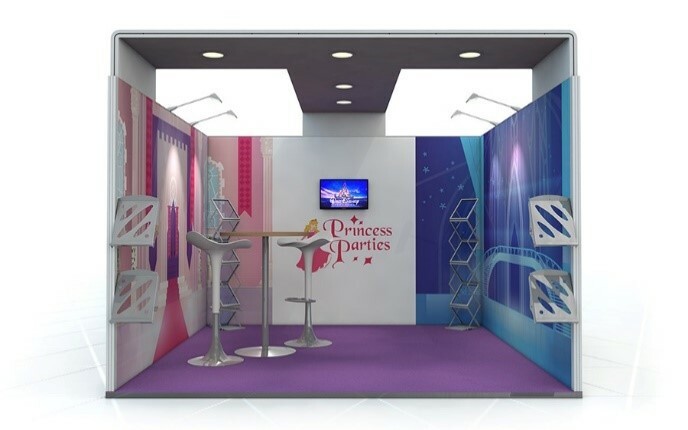 Curved Pop Ups tuck neatly into a shell scheme or in a corner of your exhibition stand without taking up valuable floor space, whereas straight Pop Ups fit flush against the wall as a printed backdrop. At £425, the 3x3 pop up exhibition stand bundle is one of our best selling products. With a small footprint but large printed display area, a 3x3 is ideal for all exhibitions and events. The exhibition bundle comes with everything you need; five printed graphic panels, an aluminum magnetic pop up frame, 18 mag bars, a portable counter with graphic wrap and two LED lights to illuminate your graphics. The 'scissored' lattice aluminium design simply 'pops up' and the graphics are attached using mag tape that ‘snaps’ on to the corresponding magnetic strips. There really isn’t anything more simple. This 3x3 pop up stand is a quick and easy way to get maximum exhibition backdrop coverage for a small investment. 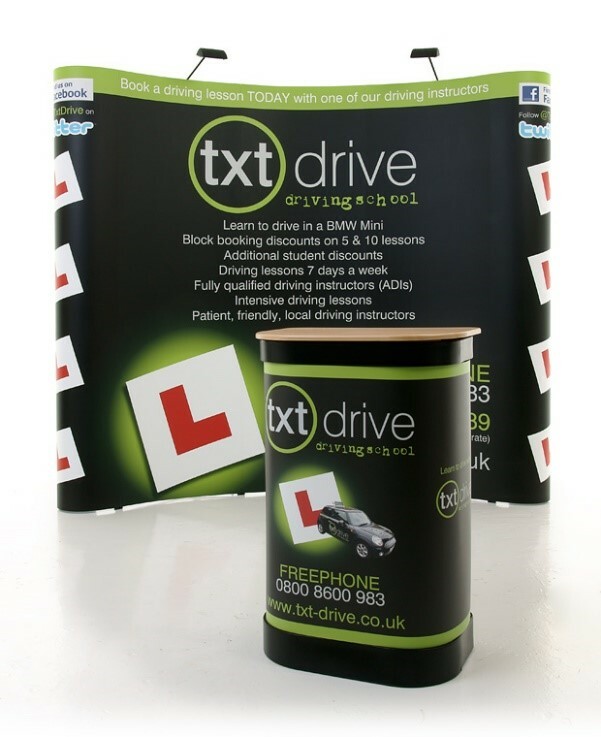 A popular alternative to traditional shell scheme printed graphics are fabric exhibition stands. This is because they offer an attractive and professional display with high impact graphics. This 3000mm Formulate straight Fabric Display provides a large and effective backdrop to effectively promote your marketing message. The seamless graphics of the Formulate straight fabric display are designed to attract attention and impress, and at 2950mm wide and 2380mm high, it definitely does. Using a print process called dye-sublimation, there simply is no other exhibition stand solution which produces such a high quality and vibrant print. The extreme heat and pressure involved in this process ensures that the colours are sharp and fresh. Unlike most fabrics, the fabric graphic can be folded up without worry of creasing. The elasticity in the fabric makes it extremely durable and stretches out any creases once the fabric is applied to the frame. The 3m x 3m linked exhibition stand is a simple yet impressive pop up exhibition display, which is why it is our best selling linked pop up stand. It is a popular choice for both new and veteran exhibitors alike. It is ideal for exhibition backdrops and for creating a panoramic printed exhibition experience within your show space. This 3m x 3m L-Shaped Pop Up Stand Kit comprises of two 3x3 straight pop up stands which have been linked together with additional graphic panels known as linking panels or ghost panels. This creates the ‘L’ shape. It also has the ability to be used in a left or right hand configuration. It is a cost effective way of creating larger exhibition stands from standard Pop Up Stands. Linked pop up displays have the ability to grow alongside your business. You can simply add additional pop up stands through the linking panels. Are you ready to take your marketing message to the next level? The XGLOO inflatable events tent is a striking inflatable that is designed around the iconic shape of the igloo. At £3830, you can have a fully branded 5x5 XGLOO inflatable events tent. It incorporates a robust building block system allowing for endless configurations. Some of the accessories that you can add include walls, canopies and even other X-GLOO tents using the linking tunnel. This allows you to create a completely bespoke structure. X-gloo’s are among the handful of products that tick every box when it comes to exhibiting. The X GLOO uses German engineering to provide a superior quality event tent that has limitless customisation options. The X-GLOO dome tent inflates effortlessly within minutes. Once inflated, the X-GLOO can stand securely on almost any surface and withstand winds of up to 60 kmph. A similar configuration to those products in our linked pop up range but made completely from banner stands is our Twist range. The twist is a flexible system which links banner stands together to create a seamless graphic backdrop. Offering you an unprecedented amount of flexibility, the Twist banner systems are a real investment in your company’s future. One advantage of this display is that it is a modular system which means that you can add different components to create an exhibition stand that is fully flexible, versatile and perfect for your business. If you attend an event on a smaller scale, you have the ability to use the banners singularly. The patented tensioning system is easy to use and keeps your graphics taut even on uneven and difficult floors. With a budget of £5,000, you can upgrade your exhibition display to a more Bespoke Exhibition Stand. We have a wide range of bespoke stands including Linear and Vector, Shell Scheme and Centro Stands. There is a solution to meet any exhibition need and our exhibition stand category consists of lots of different configurations to inspire you in creating a perfect display solution for your marketing needs. This Linear Vector Exhibition Stand 3m x 3m U-Shape is just one example of our Linear & Vector Exhibition Stands. 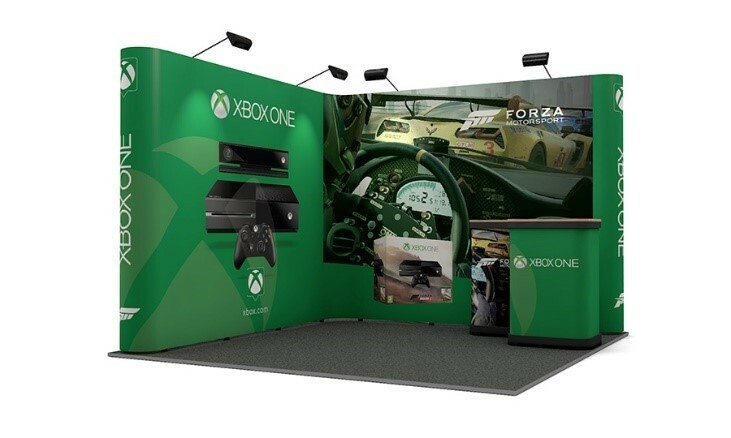 Costing £4,136, this stand is a perfect example of the type of stand a budget of £5,000 can give you. We will work closely with you from concept through to design, production and assembly to ensure you get exactly what you need. What can XL Displays offer you? We can supply quality exhibition solutions that are tailored to your business and exhibition requirements. Ranging from a simple but effective pop up stand to a custom built exhibition stand and everything in between. One of our expert sales advisors will work with you to understand your needs and explain the exhibition solutions that are available to you within budget. The design of a stand can make or break your success at an exhibition and so it needs careful consideration. We have an in-house graphic design team where one of our designers can work with you to create a show-stopping visual display. Alternately, if you already have your own graphics, we can check your artwork for free before print to ensure you receive an exceptional exhibition display.